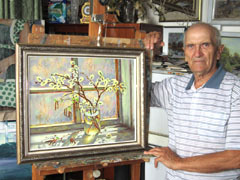 Gennady Ivanovich Panarkin was born 11 January 1940 in the Novo-Orsk, Orenburg region. Studied at the Nizhny Tagil College of applied arts (1960-1966 years). His teachers were honored artists of Russia L.G. Zudov and T. E. Kovalenko. Studied at the Leningrad Institute of painting, sculpture and architecture named after I. E. Repin (1967-1973 years). His teachers were people's artist of the USSR corresponding member of the USSR Academy of arts I.A. Silver and honored artist of the Russia professor B.V. Korneev. Gennady Ivanovich Panarkin is regular participant of republican and regional exhibitions since 1970. He is a member of the Union of artists of Russia since 1980. Since 1973 he lives and works in the city of Tomsk (Russia).